I got this Federal Thunderbolt 1000 in 2001 from Chase Frost. Shortly before that Chase bought a pile of old Thunderbolts which had originally been installed in Abilene Texas. If I remember correctly Chase obtained the sirens from a man who had purchased them from Abilene when they were removed. I don't know when that was but seems like I remember Chase saying that the sirens had been sitting out for a long time. 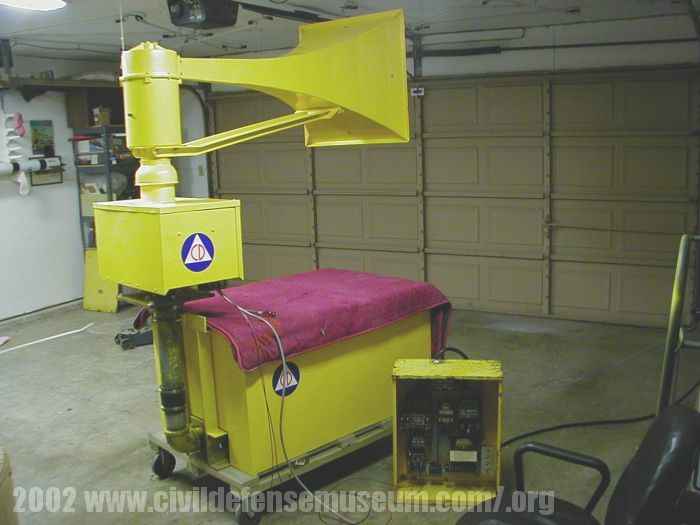 This siren has the smaller rotator box common to the mid to late 1950s-early 1960s Thunderbolts. This Thunderbolt is a single tone model 1000 series A Thunderbolt Siren. 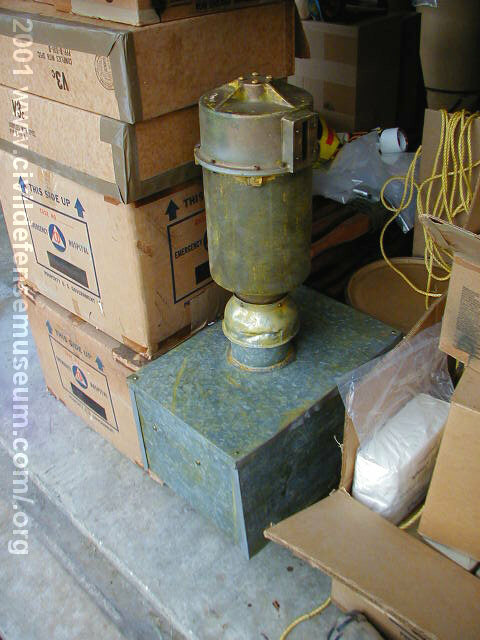 This section shows what I did during the restoration of this siren. This was the first Thunderbolt I had ever worked on so it was a real learning experience. This section shows my restoration and is also kind of a this-is-how-a-Thunderbolt-works section. This photo was taken in April 2002 just after I put on the Federal Thunderbolt decals and CD emblems. The FS Thunderbolt decals do have the later FS Federal Signal logo but I elected to put these on even though the siren should have the older circle F Federal logo because these Thunderbolt decals are original Federal decals. I didn't up any on the rotator box because I only had four original FS Thunderbolt decals at the time and I wanted to keep two in original unused condition. 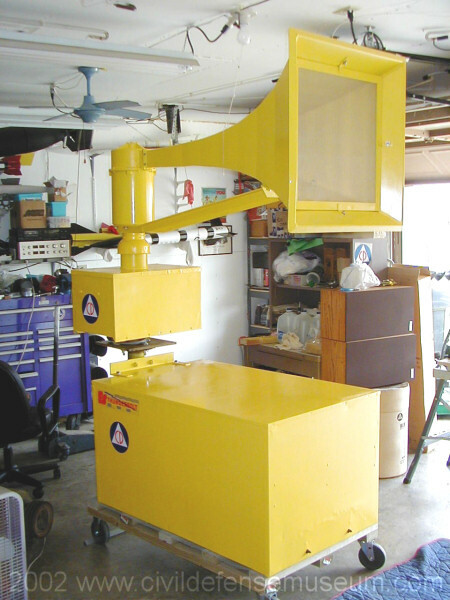 This Thunderbolt siren was sold to the Moss Lake community in North Texas in January 2006 along with another Thunderbolt that I purchased from Gainesville Texas. Both of these sirens are now in service at Moss Lake as severe weather warning sirens. 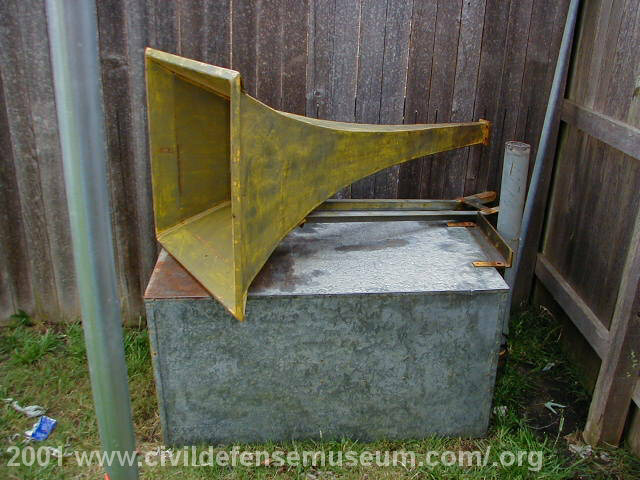 The photo above is the horn/rotator unit of the siren I restored shown in this section. I put together a separate page showing both of the sirens at Moss Lake. I'm not sure how the paint has held up over the years. It might have bleached out by now (2018) because I painted it with Rustoleum Sunburst Yellow which has poor UV fade resistance. I didn't know anything about that at the time I painted it though. As of this writing (Oct 2018) I haven't been by there to see the siren in several years. The left photo above shows the blower and horn assembly when I first got it. The worst of the paint removal was already done, thanks to Chase, when I got it. The blower air pipe, sticking up on the right, was cut off with a torch. I took the horn and had it sandblasted to finish the paint removal. Anyone else out there that is going to restore a Thunderbolt should look into having the horn sandblasted if they want to repaint it. Sandblasting is the easiest way to go with paint removal on one of these horns. The sandblaster got the horn down to bare clean metal all the way down inside the throat of the horn. The right photo above shows the chopper/rotator housing assembly as it was when I got it. The top sheetmetal of this housing was damaged so it had to be straightened before painting. The rotator is surrounded in this photo with Civil Defense Packaged Disaster Hospital supplies I had recently aquired. I really regret that I don't have any close-up videos of this first Thunderbolt restoration. Of all the siren videos I have made in my garage over the years I don't have one of this siren. This photo looks like it could be the start of one of my videos though. 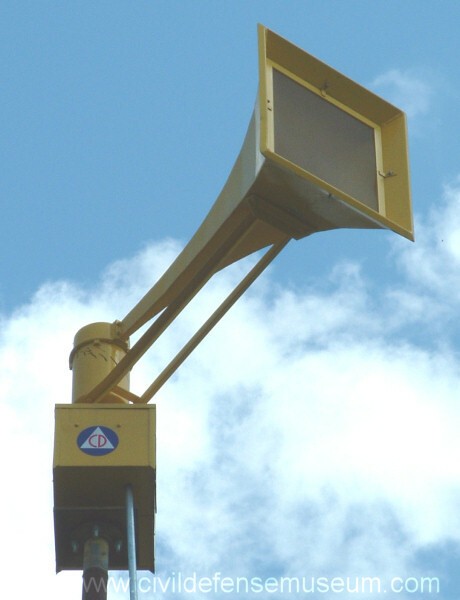 An after-installation video of this siren at Moss Lake can be seen on the Moss Lake Thunderbolts page. I guess a video of this siren actually running full-up with the blower is better than any garage video would have been anyway.